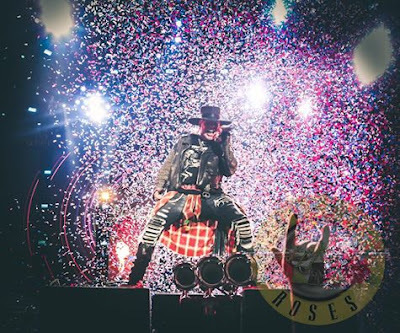 Guns N’ Roses brought their reunion tour to Arrowhead Stadium in Kansas City, MO on June 29 and video from the show has surfaced online. The third stop on the summer stadium run across North America delivered a 26-song set of classics and fan favourites from the band’s catalog, especially 1987’s “Appetite For Destruction” – the biggest-selling debut album of all time with more than 30 million copies sold worldwide. Led by the trio of Axl Rose, Slash and Duff McKagan, Guns N’ Roses also performed covers of tunes by Wings, The Stooges, Derek And The Dominos, Pink Floyd, Bob Dylan and The Who. The Not In This Lifetime tour opened in Detroit on June 23 and played Washington, DC on June 26 before hitting Kansas City. Guns N’ Roses will next perform the first of two shows at Soldier Field in Chicago, IL on July 1.